With an attractive weeping habit, Allocasuarina littoralis, commonly called the Black She-oak is a useful landscaping tree. Best described as having a natural upright habit, the mature bark is very dark, fissured and gives a textural appearance. 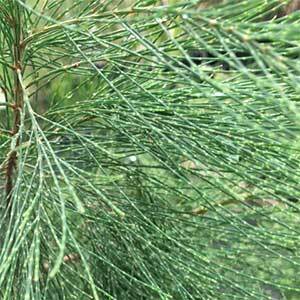 This is a fast growing tree which makes it valuable in a range of landscaping projects. It is also a species that fixes nitrogen into the soil. With a natural habitat from the east coast of Tasmania and along coastal ranges areas from Victoria to Queensland this is a very adaptable and easy Allocasuarina species. Very easy care once established as long as drainage is good. It is moderately drought tolerant, and will cope with frosts. Excellent as a windbreak tree, it attracts native birds to the garden and the trunk with its deep fissured bark is also suited to growing some epiphytic orchids. Height – To round 12 metres in height. Flowers – Male trees have attractive red flowers, female trees have smallish cones. Growth Rate – Dependant on soil and climate, from medium to fast.